Carmel, IN - Kirby V. Montgomery (Alpha Phi/Alabama 1975) has been named the 2018 recipient of Theta Chi Fraternity’s Distinguished Service Award. The Distinguished Service Award is the highest honor that the Fraternity may confer upon a member and publicly recognizes and properly honors Theta Chi alumni who, by reason of outstanding international service, personal effort, and unselfish interest, have made distinguished contributions to the lasting good and general welfare of Theta Chi Fraternity. At no time can the number of awards made exceed the number of years in age of the Fraternity. On campus, Brother Montgomery was President of the Alabama Insurance Society and a member of Gamma Iota Sigma, an international professional fraternity organized to promote, encourage, and sustain interest in insurance, risk management, and actuarial science. Brother Montgomery’s resume includes more than four decades of experience in the insurance industry including 18 years at General Reinsurance Corporation (leaving as Vice President); 11 years at Zurich Reinsurance and Converium as a Senior Vice President; and in 2004, he joined Markel Global Reinsurance in Glen Allen, VA as Managing Director and has worked as Head of Casualty Facultative Reinsurance since 2011. He is also involved with the American Institute for Chartered Property Casualty Underwriters; earning the CPCU designation. In addition, he holds an Associate in Reinsurance Designation from the Insurance Institute of America. He later completed the Columbia University Graduate School of Business Finance and Accounting Executive Program. 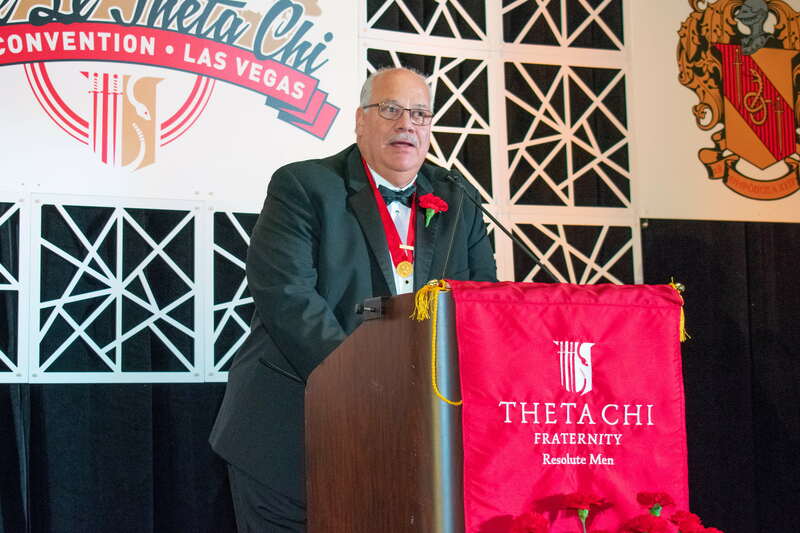 Brother Montgomery has taken the knowledge and wisdom gained from his decades of professional experience to enrich Theta Chi and the greater fraternity system. From 1989 to January 1998, Brother Montgomery served on Theta Chi Fraternity’s Risk Management & Standards Committee. Since June 2012, Kirby has served as President of Fraternity Risk Management Trust, Ltd. (FRMT), an insurance company that provides comprehensive liability insurance coverage for 33 college fraternities (including Theta Chi) and risk management education resources for collegiate and alumni members, fraternity volunteers, and professional staff members. Brother Montgomery is a recipient of Theta Chi Fraternity’s Silver Legion, Citation of Honor, the George T. Kilavos Alumni Award (presented by the Grand Chapter), and the Earl D. Rhodes Theta Chi for Life Award. Brother Montgomery is a member of Saint Michael The Archangel Catholic Church in Glen Allen, VA where he is a Fourth Degree Knight of Columbus and serves as an officer of The Joseph P. Solari Council and is the Captain of the Council’s Admission Degree Team. Kirby was awarded Knight of the Year by his Council in 2010. Brother Montgomery lives in Richmond, VA with his wife Marcie and is an avid fan and collector of classic cars. He has been a member of the Corvette Club of Richmond since 2005 and served as its President from 2014-2015. Congratulations to Brother Kirby Montgomery! Founded in 1856, Theta Chi Fraternity is a men's collegiate fraternity with more than 191,000 initiated members and has established 239 chapters across North America. Leadership development, personal development, and service to alma mater are fundamental to Theta Chi Fraternity's mission.